El Teatro Nacional or the National Theatre of Panama, inaugurated in 1908, sits on the site of a monastery that dates back to the 1700’s. The theater was designed by Italian architect Genaro Ruggieri, with a style of Italian operetta theater, and opened on October 1, 1908. At the turn of the 20th century, when it opened, it had a luxurious aura and was a destination for Latin American celebrities and governmental elite. It fell into disrepair for some years and at one point in its history was rented out as a movie house. It saw 2 separate restoration projects, one of the 1970’s and one in the early 2000’s and in 2004 it reopened to visitors. The Neo Baroque architecture alone is worth stopping by for a visit, however you can now take in a show as you could in its heyday. The ceiling features frescoe paintings by Robert Lewis, a well known Panamanian artist. 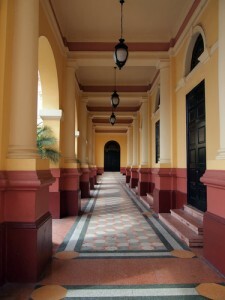 It is located at Avenida B between Calle 3 & Calle 4, next to the church of San Francisco, and the Plaza Bolivar. It is a part of a cross-shaped building. The other part of the building is the National Palace. Call +507 262-3525 for more details on shows and visiting the National Theatre of Panama. There are multi level boxes available as seating options during shows. Call to find out about on-going performances.